Every hiker on my trail gets to identify Cape Clawless Otter tracks, if you know what to look for they are easy to spot, but when it comes to actually seeing this secretive creature it’s a different story. They mostly hunt in the crepuscular hours (before dawn and after sunset)(Twilight). Otters live in areas surrounding permanent bodies of fresh water but are able to travel long distances in search of food, eating a wide variety of animals from both the sea and rivers, they are very successful predators. Being clawless helps us identify the track but for the animal helps in the search for food, feeling under rocks and in crevices often in total darkness hunting by the sense of touch. It’s worth an early morning excursion down to the beach to catch these enigmatic creatures playing on the beach and in the surf. 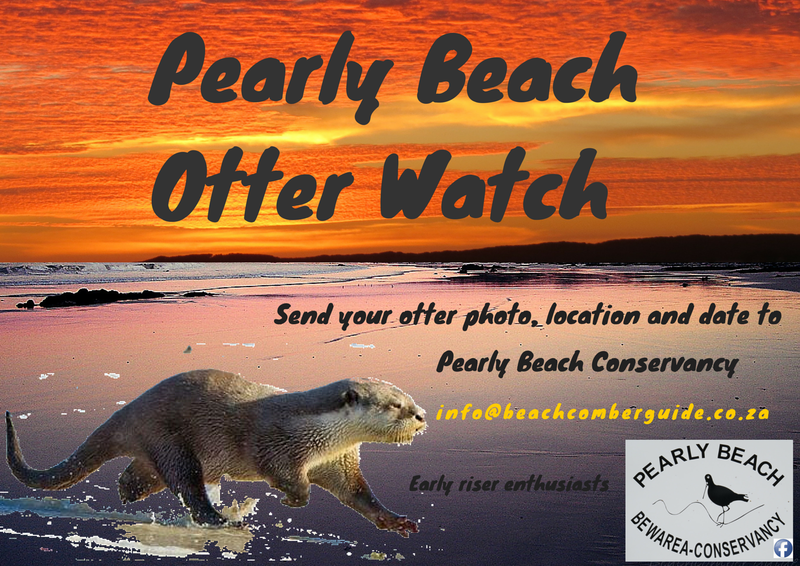 The Otter Watch is for the early risers in Pearly Beach to capture photos and document the whereabouts of Otters in the area, building body of evidence creating awareness for the residents and general public visiting Pearly Beach. Include location, date and time of day seen.